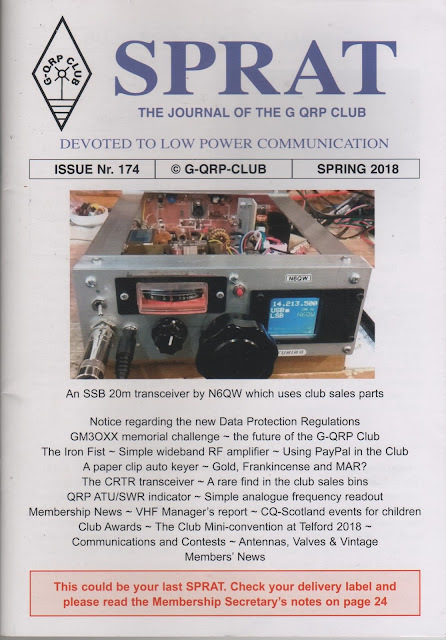 On the cover of issue 173 of our beloved SPRAT magazine they had my little Direct Conversion receiver. We joked on the podcast about the old song by Doctor Hook about getting on the "Cover of the Rolling Stone." Well, on the cover of issue 174 they have one of Pete's magnificent creations. Thanks again to the guys who put so much work into SPRAT magazine. They are now looking for some help. Please subscribe, and check out page 4 of issue 174 for details on the help that GQRP is looking for. REPRIEVE! SolderSmoke Saved by a Loophole!